In his introduction to Soliongco's articles about our post-WW2 presidents (from 1946 to 1971), one of our great nationalist, the late Prof. Constantino stated : " Soliongco's writings on post-war Philippine presidents are particularly enlightening because he always viewed them from the overall perspective of RP-US relations..."
inform ourselves about/to appreciate more deeply the roots of our perennial perdition, (share the knowledge) and then decide what to do for the sake of the "common good." President Garcia discharged his obligation to honor the memory of President Roxas, a man who enjoyed vast popularity during his incumbency, by sending a simple wreath to his tomb. The press, with rare unanimity, paid its tribute to the man by recording in some obscure corner in its inside pages the fact that yesterday, January 1, was his birthday. Beyond this routine gestures of courtesy there was nothing - no parades, no speeches, no programs. For the tragic truth is , the observance of the natal day of President Roxas has degenerated from the national event that it was in 1949 to the strictly family affair that it is today. There are indications that President Magsaysay is headed to an identical obscurity. Even such touching acts of the United States as issuing commemorative stamps and establishing her Asian version of the Nobel Foundation seem to be so inadequate against the clouds which are fast dimming the luster of the Magsaysay name. Now, there is something in common between President Roxas and President Magsaysay, something which makes them brothers in spirit, so to speak. They were both unabashed in their pro-Americanism. In justice to them, however, let it be properly recorded that they felt had to be so for purely personal reasons. President Roxas, for instance, was liberated by General Douglas MAcArthur's Americans and cleansed of the taint of collaboration. This proved to be a crucial event in Mr. Roxas’ career, for, later on, he was able to capture the presidency. To his dying day he was grateful to his benefactors. President Magsaysay, on his part, was even proud that American officials in the Philippines openly took up his cause. He never was able to get over the fact that he was singled out by the Americans as their candidate. It was probably for this and more that he never could be convinced that it was the Filipinos and not the Americans who were responsible for his election. His last speech on earth, like the last speech on earth by President Roxas, was a reaffirmation of his eternal gratitude to the Americans. But both President Roxas and president Magsaysay could not resist the temptation of expressing their gratitude officially. Thus President Roxas engineered the acceptance of the Parity Amendment to the Philippine Constitution and agreed to every onerous detail of the Military and Bases Agreements with the United States. Thus too, President Magsaysay took infinite care not to pursue policies and render judgment which would displease the Americans. The advocacy of “special relations” may have its political uses, but it is a deterrent to the attainment of independence. And since the Filipinos are supposed to be a sovereign people, the heroes and presidents they will ultimately and respectfully remember are those who believe in independence. It is therefore inevitable that President Roxas and President Magsaysay will be forgotten. President Roxas died on April 15, 1948. at a time when his popularity was still at its height. Eight years, eight months and seventeen days later, on January 3, 1957 to be precise, there appeared in the inside pages of the newspapers, a small item which reported that the good people of Roxas City, Capiz, were bitter about the fact that the man after whom their city was named had been completely forgotten by the nation. It is only to be expected that the few remaining worshipers of President Roxas should single out partisan politics as the reason behind the neglect of their idol. It is, after all, the most easily available and the most easily understood reason. Moreover, it will enhance the figure of the late president if it is advertised that he is no longer remembered because his political opponents who are now in power are determined to obliterate the last traces of his memory. With due respect to the good people of Roxas City, however, we would like to venture the opinion that politics has nothing to do with the bitter fact that the nation has neither the inclination nor the time to pay homage to president Roxas. For even if the Liberals were in the saddle the situation would be the same. The memory of President Roxas has been forgotten not because the Nacionalistas want it to be so but because history says that it must be so. For President Roxas, despite his amazing intelligence and intellectual background, was sadly unaware of the “historical situation” of his time. Indeed, if the truth be told, what he tried to do was to turn back the clock of history. He dealt with our national problems as if the Philippines were an American colony and the Filipinos the most loyal subjects of the United States. Thus, it was he, in cooperation with the most backward policy-makers in Washington, who engineered the ratification of the Bell Trade Act, the inclusion of the Parity Amendment in the Constitution and the signing of the 1947 Bases Agreement. All these acts are certainly a denial of the historical situation. All these acts in other words, are crimes against Filipino nationalism. In his desire to retain the friendship and loyalty of the Americans to whom he attributed his victory over Osmena, President Roxas literally went against nationalism and committed the grievous sin of identifying the national interest of the Philippines with the national interest of the United States. He was, in effect, the highest native agent of the United States government in the Philippines. He thus did a great disservice to the Philippines. 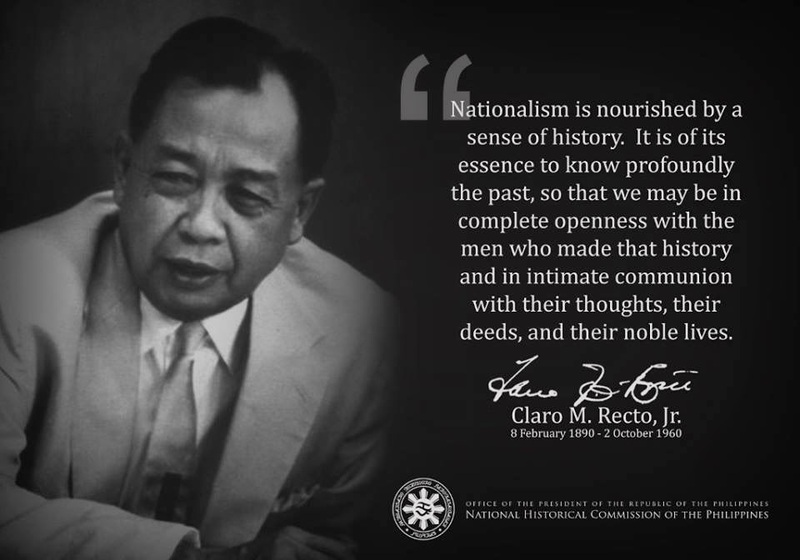 The ill effects of what during his lifetime were regarded as his greatest achievements, namely, the Bell Trade Act, the Parity Amendment, and the 1947 Bases Agreement, are now being felt and they are now being seen for what they are -the stumbling block to the full flowering of Filipino nationalism. It is not by accident that the Filipinos pay homage to those of their heroes and leaders who were nationalistic. President Quezon, for all his serious faults as a politician, was the most nationalistic of all our presidents. His, to be sure, was not the nationalism of a Nehru or a Sukarno. But there is no question that he was more nationalistic than Roxas, Quirino or Magsaysay. For this single virtue,-and it is everything in the eyes of history- his memory is still fresh in the minds of his countrymen. Is it argued that the dynamic personality of President Quezon is what is remembered and not his nationalism? Why then do we still remember Bonifacio and Del Pilar, men whose personalities we know only through their nationalistic exploits and nationalistic utterances? 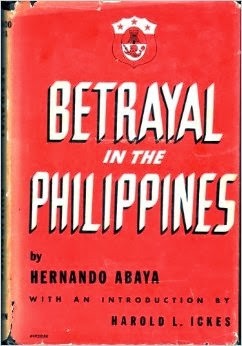 NOTE: Hernando J. Abaya's 1946 expose'/book "Betrayal in the Philippines," is an excellent read. He was a confidential secretary at the office of President Quezon, lived through the Japanese occupation and later, on the staff of the Manila Times. ”We gave the Philippines political freedom to enter the world family of nations, but did we give them internal political liberty? More important still, did we grant them economic freedom?” – Harold L. Ickes, longest tenured U.S. Secretary of the Interior (1933-1946) in his Introduction to the book. Two months after the granting of independence, the book publishers had to wait for Abaya to be safely out of the country before releasing the book. Description of The Philippines Reader. A collection of essential readings and documents providing background on the continuing people's struggle of the Philippines for true independence and social justice—from the turn-of-the century US war of conquest to the administration of Corazon Aquino. Analytical articles from varying authors explore, among other topics, the nature of the US colonial regime, the role of the church, conflicts with national minorities, the situation of labor, peasants and women, and US policy, as well as prospects for the future. Documentary selections in this Philippines Reader come from such diverse sources as the CIA and the State Department; US Presidents McKinley and Reagan; Philippine leaders Aguinaldo and Aquino; Philippine nationalist and Left organizations such as the Anti-Bases Coalition, Bayan, Kaakbay, and the New People's Army; and US opponents of foreign intervention.